In stock -This product will ship today if ordered within the next 2 hours and 30 minutes. The most advanced in the Bodyclock range, the Luxe 750D has high-quality speakers for streaming your own music or for radio via Bluetooth, as well as a USB port for more audio files or for charging your phone. It also comes with over 20 wake-up and sleep sound effects, from classic birdsong and waterfall recordings to background café chat and fading thunder. Take a look at our Lumie Bright Spark SAD Light Box and Lumie Bodyclock Luxe 700 - Sunrise Alarm Clock to find out more about the benefits Lumie products have to offer. 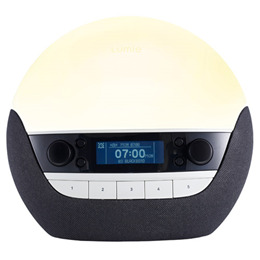 Below are reviews of Lumie Bodyclock Luxe 750D - Sunrise Alarm Clock by bodykind customers. If you have tried this product we'd love to hear what you think so please leave a review. Excellent radio/sunrise alarm. 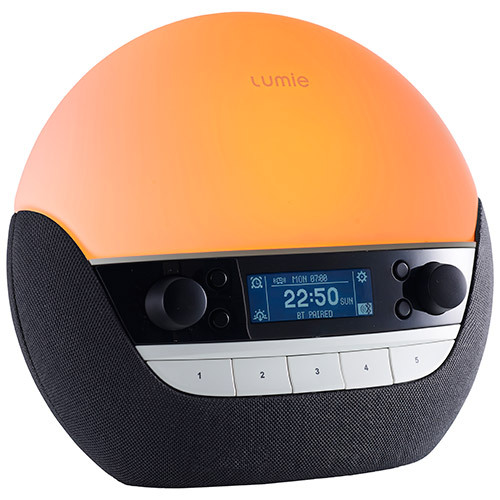 Have had the lumie body clock 30 for years but love the red shades of the low level lighting, can charge my phone so have less plugs lying around and no longer need a separate radio. Well worth the money. Really pleased with this clock. It sends me gently to sleep listening to the robin and the dawn light wakes me before the alarm has had a chance! I used to wake with a headache using a conventional alarm clock but not any more. Would highly recommend.